It has been quite a week for Alhambra Nievas, on Wednesday night at Twickenham Stoop she swapped the warmth of her home in Andalusia, for a cold wet autumn night in south-west London to referee England against France, at Twickenham Stoop, a match won by the home side 10-5. Then to finish the weekend in style, she deservedly won the 2016 World Rugby referee award, along with Rasta Rasivhenge, at a glittering ceremony in the London Metropole Hotel. Being a referee in the modern game is not for the faint hearted but the young lady from Granada doesn’t do “faint hearted". Eleven years as a professional rugby player in Spain, including three seasons in the Spanish national team, “Las Leonas”, has given her the experience, and players perspective,that has been a crucial ingredient in making her such a popular, and well respected official. A back row forward who faced down Maggie Alphonsi whilst playing for Spain against England is not likely to be phased by too much in the rugby field. “I got more enjoyment from a tackle than from scoring a try ” she told me, now there speaks a true back row forward. Her CV is impressive to say the least, as must be her air miles total, having officiated in the 6 nations, the women’s rugby World Cup, and the Olympic Games in Rio. 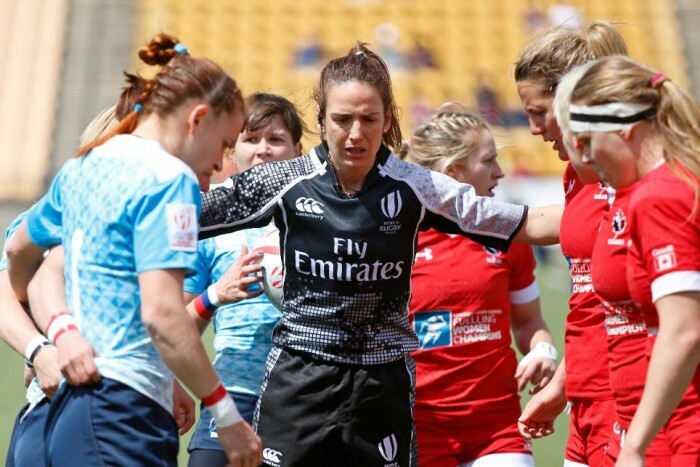 Alhambra has circumnavigated the globe refereeing in the world sevens series, and there is no sign of any easing off with San Sebastián, London and Dubai tapped into her refereeing satnav during the coming weeks. Being appointed assistant referee for USA v Tonga, in San Sebastián on November 19, creates yet another ground breaking statistic, as she becomes the first female match official at a tier two international. I caught up with Alhambra over a coffee last week, during a whistle-stop tour during which she will cover just over 4000 miles before she returns to Twickenham on November 26 to referee England v Canada I encountered a delightfully modest and down to earth young woman, whose love of rugby and the values it represents came shining through during our chat. She spoke of the camaraderie that exists between all the top women officials, where no one puts individual ambition above the team ethic. The road to the top started, aged 19, at Malaga university, taking up rugby, where she was put on the wing, before being told to go into the back row as the team were a forward short. Her refereeing journey started some time later when she was asked to make up the numbers refereeing at a children’s rugby tournament. “I had no aspirations to be a referee, I was quite happy playing and refereeing kids tournaments” Alhambra told me. But her talents were recognised and eventually a choice had to made between playing and officiating, the rest as they say is history. Nicknamed “Marmot” by her whistle blowing colleagues, due to her legendary abilities in the siesta stakes, she is certainly wide awake come kick off time. Off the field she enjoys the cinema and spending any little free time she has with her family in their small village in Granada, oh and she is partial to ice cream and the occasional burger. Other sports she enjoys include basketball and tennis, a big Rafa Nadal fan and a great admirer of Spanish swimming star Mireia Belmonte. With people like Alhambra Nievas Gonzalez involved in the game it ensures rugby and its intrinsic values are in safe hands. She was named after the beautiful palace in Andalusia, and it’s literal meaning is “the red one” well let’s hope that has no bearing on the colour of the card she produces during the coming weeks and months .